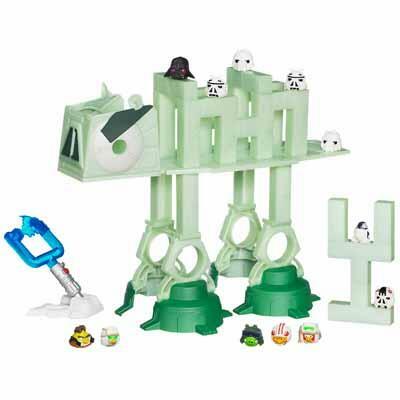 Just in Time for May 4th, Star Wars Day, Comes Angry Birds Star Wars! When Angry Birds first came out as an iPhone app, my 7-year old son (and husband) were completely obsessed by it. Cheers of elation were heard in our household whenever a "pig" was defeated, and the game level subsequently completed. When Angry Birds Star Wars came out as an app, my family was similarly enthused. So, it is for them, all Angry Birds fans, Star Wars fans, and lovers of games that I announce Hasbro's exciting Angry Birds Star Wars games line! Available now! Great for Star Wars Day, May the 4th! 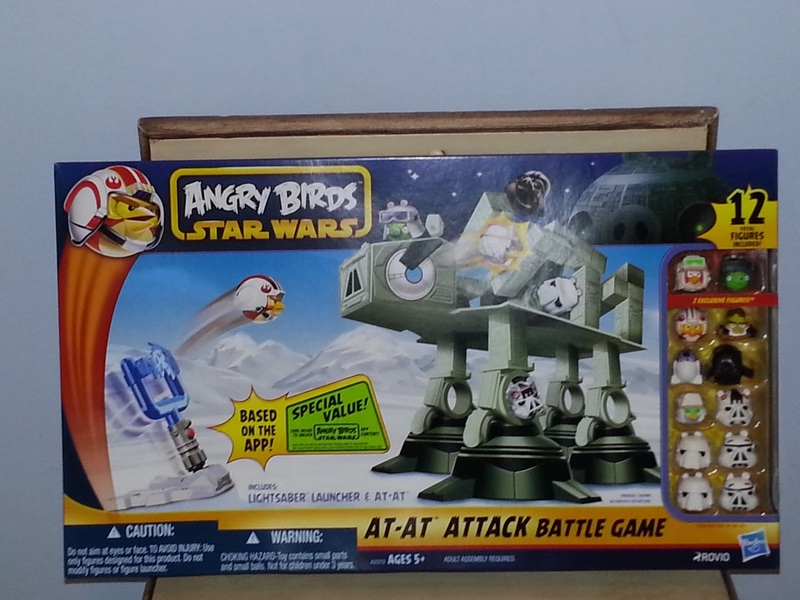 Hasbro's Angry Birds At-At Attack Battle Game! In Hasbro's Angry Birds Star Wars At-At Attack Battle Game, the Angry Birds crew is in costume as miniature Darth Vader, Luke Skywalker, R2D2, Han Solo, Rebel Trooper, Storm Troopers, and more! There are 12 figures in all (2 are exclusive to the At-At set). Just like in the Angry Birds videogame, launch the "birds" to defeat the "pigs", and knock down the 21 blocks on the At-At (bad guy vehicle). Each pack comes with a special code to unlock in-app content. Game is for ages 5+, retails for $39.99. Also available, Angry Birds Star Wars Millennium Falcon Bounce game, for 1-2 players. Ages 8+, retails for $19.99. Or check out Angry Birds Star Wars Foam Flyers, ages 5+, retails for $9.99. All Hasbro Angry Birds Star Wars games are available in-store now. May the "4th" be with you! WIN Hasbro's Angry Birds Star Wars At-At Attack Battle Game! 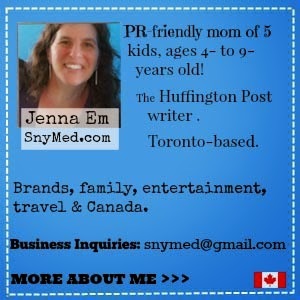 Sorry, this contest is only open to USA readers...my apologies in advance to Canada. Ends Tues May 7th, 2013. Leave a COMMENT below stating if you like Star Wars, Angry Birds or both...and mention a favourite character if you have one. Then, use the entry form below to enter. GOOD LUCK! We love both. Obi Wan Kanobi is our favorite. My kids LOVE Angry Birds and Star Wars. We have a couple of these and they're always playing it :) Great way for them to use their imagination too! Oh boy! Looks like a trip to the toy store is in order. We've got Angry Birds AND Star Wars fans here too. Thanks for the info, SnyMed! My boys have this game from Christmas and they love it! Can't wait to check out some of the new ones too! Looks like so much fun. I'm addicted to Angry Birds lol.